I found Rettberg’s multi-faceted definition of ‘filter’ to be extremely intriguing and dynamic. On the surface, our society sees filters as a kind of ‘net’ to capture impurities. In technology, a filter is used in a very similar way to metaphorically remove search content that is irrelevant depending upon the specific keywords and phrases searched. In an exclusively social media reference, a filter is a tool used to add or subtract certain light colorations to your images to enhance the appeal of user photos. Despite the abundance of valid definitions for this term, I find the most important definition to be related to a sociotechnical aspect of our societies. Cultural filters are quite possibly the most important filters to recognize, because they help determine the norms and customs of a society. In turn, abiding by these rules helps users gain more likes, followers and favorites. For example, in my community of UCLA students, we find it out-of-the-norm to post Instagrams more than once every few days. The individuals who decide to break this social norm are seen as undesirable or like-hungry. Instagram filters have been steadily declining in popularity as they have became too obvious and recognizable to users. In a Business Insider article that was posted at the beginning of the year, it reported that the new social norm is to not apply filters to images because it was the ‘uncool’ thing to do. Further analysis on this idea, combined with my experience and social participation in this group of millennials reveals that adding filters can seem like the user is trying too hard to fit in by making their photo as worthy to their followers as possible. From this, an emerging normality in the social media world is the use of the hashtag #nofilter and VSCO Cam. Despite the the dated popularity of using filters to enhance images, many millennials take pride in their budding photography skills and make it known to their followers that their image wasn’t enhanced with a filter, to show the natural beauty of the image. Another emerging technology is the VSCO Cam app. This app uses lighter filter options to add an old fashion filmy quality to photos to make it seem like the user isn’t overdoing it with lights and coloring additions, as seen below. This entry was posted in Uncategorized, Week Four on January 27, 2015 by nklepper. Rettberg shows that “individual devices have technological filters that are themselves influenced by cultural filters” and discusses the app SkinneePix, which lets the user take selfies that make them appear thinner by ‘removing’ up to 15lbs from the image. Rettberg details this as an example of “how we are aware that technology filters our visual representations” (28). I found this example interesting because it highlights the cultural ideal of thinness that is so prevalent within our culture. SkinneePix’s website is http://prettysmartwomen.com/skinneepixapp/, which name itself shows that prevalent culture only sees thin women as pretty and smart, also states: “SkinneePix helps you edit your Selfies to look 5, 10 or 15 lbs. healthier in two quick clicks on your phone. It’s easy. It’s simple. It’s fun. Share them with your friends immediately. SkinneePix makes your photos look good and helps you feel good.” Again, the use of words in this blurb is telling. By using the word “healthier,” this app implies the thinner you are, the healthier you are, which cannot be further from the truth. This small example shows a larger cultural theme at play in our society: how you look is the most important thing. In the article “‘Why Don’t I Look Like Her?’: How Instagram Is Ruining Our Self Esteem,” author Olivia Fleming discusses how Instagram is changing how many woman see themselves in relation to other woman. One model interviewed, who helped put together the un-airbrushed 2014 charity calendar says, “[Instagram] is so much scarier than magazines. At least most people realize that magazines and campaigns have been airbrushed. But young girls are looking at selfies on Instagram and they’re not realizing that some people are using apps to totally change what they look like.” This trend enables social media to have more of a “detrimental impact to the body image concerns of college aged women than advertising or the media generally.” While it is true social media is shaped by both technological and cultural filters, it is important to note when these filters begin to impact the real world, and real peoples perceptions of themselves in negative ways. This entry was posted in Week Four and tagged cultural filters, technological filters, why don't i look like her on January 27, 2015 by snmarquez. 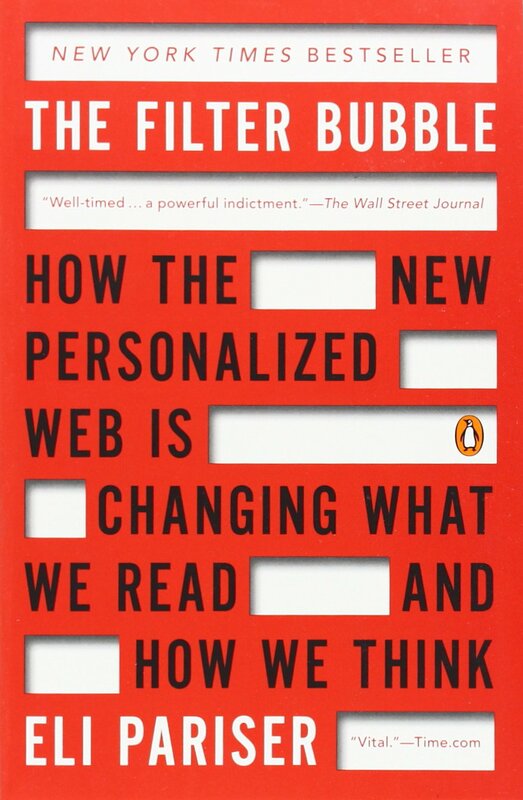 One of my favorite books about Internet culture is The Filter Bubble by Eli Pariser, which was published in 2011. In the book, Pariser discusses the algorithms search engines like Google, social networking sites like Facebook, and other websites use in order to personalize an individual user’s experience. Google, for example, guesses what search result would be most relevant to you based on your search history, your browsing history, your location, and other idiosyncratic factors, meaning that the search results you get might be vastly different from what a different user with a different background might receive. This is, ostensibly, pretty great–after all, who wants to sift through a bunch of irrelevant search results before they find the website that they’re actually looking for? Who wants look at boring photos on their Facebook feed when all they really care about are Buzzfeed quizzes and news articles? The use of these algorithms help to tailor our experience of these websites in a way that makes them more useful to us. However, the application of these filters enable Internet companies to collect information about your browsing habits in order to target advertising. They see you frequently like Upworthy videos that show up on your Facebook timeline, so they make sure those videos appear more often…and also display ads about charitable donations and “socially conscious” companies. They notice that you tend to Google the lyrics to Top 40 pop songs, so they make sure that lyrics (as opposed to Wikipedia articles or music news sites) floats to the top of your search results…and also display ads about local concerts and newly released albums. A world constructed from the familiar is a world in which there’s nothing to learn … (since there is) invisible autopropaganda, indoctrinating us with our own ideas. Research has demonstrated that individuals who only associate with people who agree them become more extreme in their beliefs and values than they would be if they were exposed to a diverse array of ideologies–and if you look at research on the increased political polarization of US society, that definitely seems to hold true: over the past 10 years, the number of people who lie on either extreme end of the political spectrum has vastly outstripped the number of moderates. To put it differently, Republicans are becoming increasingly more conservative while Democrats are becoming ever more liberal. The filtered nature of our virtual reality is vastly impacting the political structure of our society, and I’m not so sure that that’s a good thing. This entry was posted in Week Four on January 27, 2015 by d. o..
“Feeling myself today. Can I live? !” An all too familiar caption used by stereotypical, selfie-takers to accompany their self-portrait of the day. Personally, I love when women (or men!) embrace this type of attitude. Do you. Slay mama. Recently at a show I observed a teenage girl in the crowd unashamedly shoot a selfie of herself when I was strangely reminded of good old Descartes and thought to myself, “I selfie, therefore I am”. Selfies, at least in this consumer-driven society, has embedded itself into our daily lives and confirms our place at the “centre of our own world” (17), to each his own. Partaking in this form of self-representation however, as Rettberg argues, has succumbed to an onset of derogatory implications. Of course I advocate the right for our women to express themselves freely and loudly as we please. However, I also think that if “young women in their teens and early twenties for the first time have found platforms that allow them to speak without censorship to large public audiences (18) then we should utilize this force to go beyond topics of fashion, make-up, and OOTDs. I came across an article about a Norwegian reality show sending successful, leading fashion bloggers to experience for a month, a glance into the life of a Cambodian textile worker. The mere concept of the show strikes a pause in our own busy worlds of consumption where fashion bloggers are typing away faster than these poverty-stricken, Cambodian textile workers can manage to sew. With the incredible quantitative following these bloggers attract, I almost feel that it is a responsibility to acknowledge where our material things are coming from. We tend to commend ourselves for speaking freely and quickly through social media amongst a global network, but I think we should ponder our thoughts just a little longer before hitting ‘publish’. This entry was posted in Week Four on January 27, 2015 by caropark. He states that, “Instagram certainly isn’t new, and it’s actually an app I enjoy, but every now and again, I encounter a picture in the “real world” (AKA, any site outside of Instragram) where someone decides it’s a good idea to use it when trying to take a picture of something they’re legitimately trying to show,” Macirowski wrote. “Something had to be done.” There fore he developed Normalize. But as the article about the app shows it does in fact have some flaws. As shown in this picture of a filtered sunset, the graininess is removed but the color balance is thrown off because of the temperature and saturation of the photo. Obviously, this isn’t the way a sunset is ‘supposed to look like’ but it’s a form of expression. It is not up to us to characterize how someone else’s photo is supposed to look on Instagram, but rather it is the freedom of expression from that particular Instagram user. Instead of forgetting about filters and there ever changing presence on Instagram it is important to appreciate there existence. “Filters can get worn out or clogged up over time, letting more particles through than before, or altering the flow of the water, air, rays or words, mages, numbers and behaviours that pass through them. We can change, clean, adapt, resist or remove filters. But most of the time we simply take them for granted, not even noticing that they are there,” (Rettberg, 22). By using a filter, or choosing not to use a filter we are establishing a language through terministic screens. This entry was posted in Week Four and tagged filter, instagram, sunset on January 26, 2015 by ErikaFriesenN. The site UpWorthy.com is rooted in the idea of filtering out negative ideas and keeping an eager enthusiasm for life a common trend in their posts. The intention of the site is to post content that “matters”, things that are purely inspiring, motivational, happy or simply supporting great causes. I have found out about dozens of fascinating things happening in the world and drawn to continue surfing through the site because of captivating title lines like, “A Girl Comes Up On Stage And Destroys All We Assumed About Kids” . How can you not be interested in clicking on that? It’s also frustrating, because every video tries to be the most important video. One may argue that these are creating high expectations and filter the way in which we perceive and interpret the videos we see…. Anyway. The video I found is simply an interesting application of Instagram and hash-tagging. Jill Walker Rettberg would site the Litterati movement as positive effects of accounting, habit tracking, and digital history. I see the implications of “Litterati” even more interesting in contrast to this weeks readings, in the sense that a filter on Instagram attempts to glorify encountered trash on the street. It’s a total criticism and backwards use of a “filter” as Rettberg defines it as “the removal of unwanted content or impurities”. In this case, it serves as an aesthetically pleasing documentation of littering and environmental harm, yet in an effort to clean the world around us. In addition to challenging the simply word “filter”, Jeff Kirschner is using the data collected by Instagram to make a difference in city planning and reaching out to brands to consider changing the way littering effects brand-ship. Filtering on instagram, to filter the trash in the street. While I support this cause, I will most likely do so as an observer rather than a contributor of #litterati data: as I am terribly guilty of strategically filtering my own posts on Instagram. This entry was posted in Week Four on January 24, 2015 by Skylar_Elis.